The Safety, Health and Environmental Management System (SHE-MS) was integrated with the CPEMMP, whereby a systematic approach was developed to control and facilitate the SHE-MS procedures, as illustrated in the diagram below. HPC, owner’s engineers, and construction contractors are dedicated to conducting business in the manner to “Protect Life, Reduce Loss of Properties and Preserve Environment”. 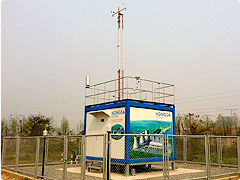 The Safety, Health and Environmental (SHE) Policy has been put into practice through the effective implementation of management system in accordance with international standards, identifying the assessment and management of risks arising from all activities during the construction phase – including risks to the environment, host communities, employees and contractors. SHE Risk Assessment: The SHE risk assessment includes all project activities. Its concept is concerned with not only activities posing adverse impacts to the livelihood, but also the methods to control such impacts. Legal and Requirement Framework: All applicable laws and requirements committed with GoL serve as the information guideline for all governances to establish their plans and procedures. Objectives and Targets: A great effort is to be made in devising and implementing the SHE-MS policy, focusing on key objectives and targets as shown in table below. To facilitate effective SHE management, it is important that SHE roles and responsibilities are clearly defined. 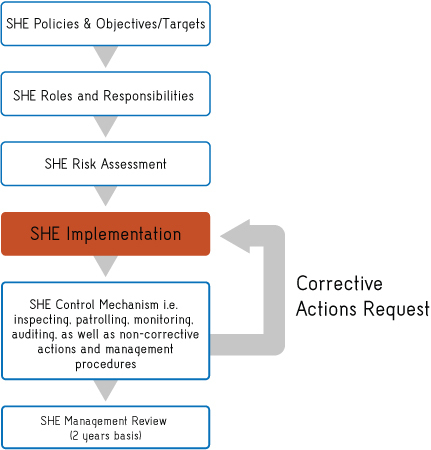 Each business unit – including corporate SHE, the Owner’s Engineer (OE), and the contractor – is obligated to provide resources essential to the implementation and control of SHE management system, in order to accomplish the SHE Policy and targets. Based on the result of risk assessment, SHE plans and procedures are developed in line with the Company’s SHE policies and objectives, in order to assure that requirements under the Concession Agreement (CA) are met. All operation procedures will be reviewed and updated annually to ensure best practices. Inspection and monitoring programs concerning Safety, Health, and Environment were established to maintain compliance with implementation and corrective actions stated in the Concession Agreement. To achieve optimal performance, inspection is categorized into two levels: contractor level and business/corporate level. In case of failure to implement and comply with SHE requirements, the inspector/auditor has the right to report any non-compliance to SHE business units, owner’s engineers, or the Corporate SHE department. There are three levels of Non-Compliance Reports (NCRs), based on the degree of risks, impacts, and priority of required corrective actions. Both internal and external audits serve as a tool to help HPC accomplish SHE requirements and improve the SHE system, contributing to one of the Company’s goals of soon becoming certified to international environmental standards, e.g. ISO 14001. In addition, an external audit shall be carried out annually by MONRE’s auditor team. Non‐conformances or observations identified during the audit are subject to correction and improvement. To maintain the development of SHE-MS, management review for all key elements of the system will be carried out every 2 years to correspond to the revision of the CPEMMP as required by CA Annex I.